A judge in mid-Missouri’s Cole County heard arguments from both sides Thursday in Jefferson City in the Missouri Democratic Party’s lawsuit against Governor Mike Parson (R) and Lieutenant Governor Mike Kehoe (R). Lawyers representing the governor want the case dismissed. 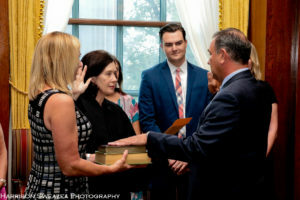 Parson appointed Kehoe to the post on June 18, saying the lieutenant governor position reassures Missourians that all operations of state government will continue. The Missouri Constitution doesn’t specifically address how the lieutenant governor should be replaced when there’s a vacancy. Missouri Democratic Party lawyer Matthew Vianello says the governor does not have authority to appoint a lieutenant governor, citing Missouri Supreme Court cases from 1912 and 1977. “I think that those cases support the position that we’re taking, which is that the Constitution and Missouri statute does not provide for anybody to fill the office of lieutenant governor if there’s a vacancy,” Vianello told reporters on a sidewalk across the street from the Cole County Courthouse. Jack Danforth served as Missouri’s Attorney General from 1969 until 1976, when he was elected to the U.S. Senate. The Missouri Democratic Party is asking Judge Beetem to issue a ruling which says a governor cannot appoint a lieutenant governor, when the lieutenant governor’s position is vacant. Judge Beetem has not ruled in the case, and has requested more legal briefs from both sides by Friday afternoon. Vianello tells reporters he wants the judge to rule that Kehoe’s appointment was invalid. “What it accomplishes is a understanding of what the law is and then the ball would be in Mike Kehoe’s court, or the governor’s court or the Attorney General’s (Josh Hawley) court,” says Vianello. Lawyers representing Governor Parson are asking Judge Beetem to dismiss the lawsuit. First Assistant Attorney General D. John Sauer tells the judge the appointment is authorized by Missouri state law. Both sides disagreed in court Thursday over the interpretation of that language. Sauer also tells Judge Beetem there are “fundamental problems” with the petition from lead plaintiff Darrell Cope. Sauer questions the legal authority or ability of private citizens to seek the ouster of a statewide official. The lawsuit was filed by the Democratic Party, with lead plaintiff Cope, a World War II veteran from southwest Missouri’s Hartville. Cope, who was not in court Thursday, is quoted as saying he fought the Nazis to defend the freedom to elect leaders. Former Missouri Governor and Attorney General Jay Nixon, a Democrat, says the governor has the authority to fill a vacancy in the Lieutenant Governor’s office. Nixon served four terms as Attorney General. Former Governors Matt Blunt (R) and Bob Holden (D) agree with Nixon’s interpretation. 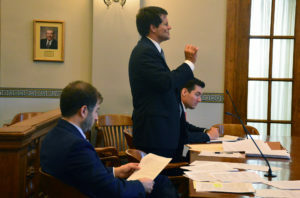 Sauer was joined in court Thursday by Daniel Hartman, the Chief of Staff for the Missouri Attorney General’s office.